Status codes enable contact center supervisors to track how an agent spends their time through a workday. When an agent is logged in to Agent ConsoleVirtual Contact Center's browser-based graphical user interface (GUI) used by Agents to manage customer interactions., they accept or reject interactions (if permitted by administrators), takes breaks, works offline, or logs out. As a supervisor, you may want to know reasons for an agent changing the status or rejecting an interaction. AgentAgents use the Agent Console to view and manage customer interactions. Virtual Contact Center supports Regular agents and Supervisor agents. statuses, such as On Break and Work Offline, do not point out the specific reasons for status changes by the agent. The status codes associate an agent’s status change with probable reasons, and enable supervisors or managers to track agent work patterns. Your contact center administrator can create customized status codes in Configuration Manager if the Virtual Contact CenterA contact center that enables agents to be located in different geographical locations yet managed as if they were located in the same physical location. tenant includes the optional status codes feature. The following table lists agent status changes with examples of corresponding status codes. Examples of Status CodesThe Status Codes feature enables agents to supply supplemental information about why they changed their state. Status Codes provide enhanced workforce planning and management. For example, status codes could be created for different categories of breaks such as Break for Lunch, Break for Meeting, and so on. As an agent processes interactions and changes their status, Agent Console prompts the agent to select from your list of customized status codes. Agent Console incorporates the available codes into historical reports. Agents assigned to a status code list are presented with individual status codes in the list when they choose an action associated with codes. The agent must choose a code from the presented list, and only then is allowed to proceed with the action. For example, when an agent who is active changes their status to Work Offline, a list of status codes associated with the action, such as Attend Meeting and Project Work, are presented in a drop-down list on the Control Panel. The agent must choose a status code from the list that describes the reason for the status change before being able to work offline. Agent: Status change details: The report gives detailed information on an agent’s status changes, the time at which an agent changed their status, and an associated reason, if any. When the supervisor browses through the report, they get information about how often an agent changed status, as well as the reason for status change. 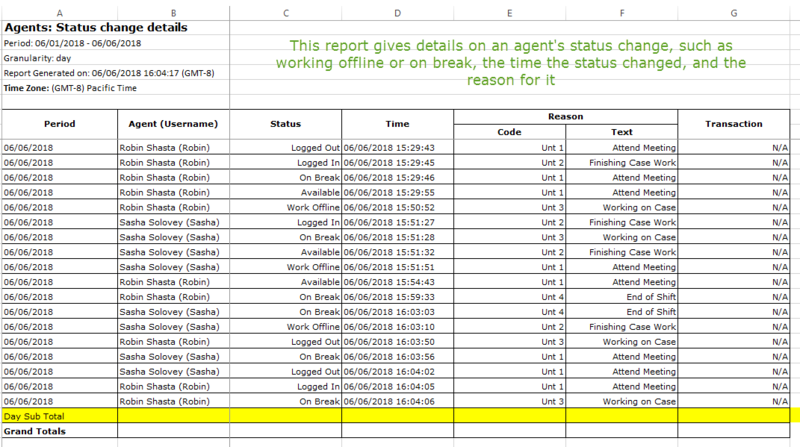 Agents: Time on Break/Offline with status codes: The report indicates how an agent spends time on each task while working offline or on a break. The report summarizes information on time spent on each status code by status, by agent, and by date. For example, if Agent Beatrice spent 2:11:15 checking tickets and 0:27:12 attending personal phone calls while working offline, the report indicates Beatrice spent 82.8% of her total working offline time checking tickets, and 17.2% for personal calls. The report also indicates the total time spent by status code for all agents included in the report.